Shocking video appears to show two people hitching a ride on the back of an MTA bus as it moved along a major Staten Island thoroughfare, bending their knees slightly to maintain balance as the bus shifts lanes. 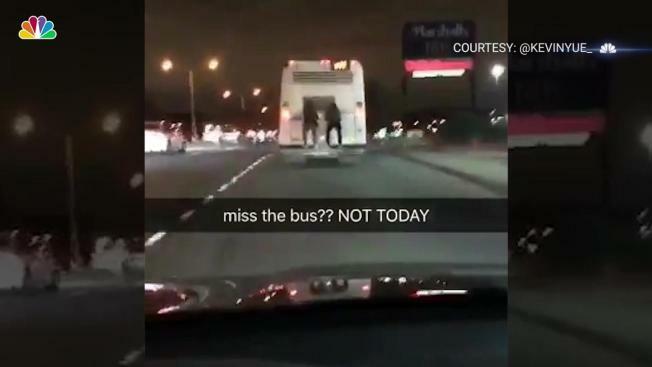 Shocking video shows two people hitching a ride on the back of an MTA bus as it moved along a major Staten Island thoroughfare over the weekend, bending their knees slightly to maintain balance as the bus shifts lanes in the dark. Twitter user @kevinyue_ said the daring duo rode on the back of the bus on Richmond Avenue for a few minutes until the bus stopped at its next location. He posted the video, aptly captioned "miss the bus?? NOT TODAY," to Twitter around 6 p.m. Christmas Eve, describing it as a scene straight out of the movies. It's since been viewed more than 34,000 times. An MTA spokeswoman slammed the risky behavior Thursday. "This is an extremely dangerous and illegal -- not to mention stupid -- activity to engage in, and we encourage motorists or anyone who witnesses this behavior to immediately notify the bus operator if possible, or call police," spokeswoman Amanda Kwan said in a statement.